There are three types of ear reconstruction surgery that patients who wish to restore a normal look and function to their ears can choose from. Each has its own unique benefits. The following is a brief description of each that patients can use to help decide which would be the right option for them. This procedure involves partial reconstruction of the upper half of the outer ear cartilage. In more severe cases due to mild birth defects, creation of an entire external ear is necessary. The most commonly prescribed surgical option for full reconstruction involves taking the patient’s skin–usually taken from an arm or leg–and grafting it around a polyethylene-plastic frame base. Partial microtia usually involves removing the patient’s own living cartilage and grafting it to the affected area. This is a simple, highly individualized surgical procedure that is most often performed on an outpatient basis to correct oversized ears. Thousands of patients undergo this operation in the U.S. every year to correct simple anatomical types of ear deformities. Also referred to as ear pinning, recovery time from this ear reconstruction procedure often takes about a month and involves wearing an elastic headband in the evenings for a brief period as the new cartilage hardens. 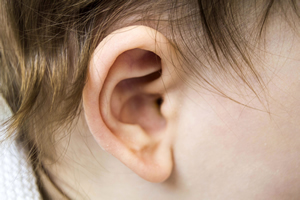 Injuries to the ear can range from common vehicle accidents to a previously unsuccessful ear procedure. Deformation can also occur if the patient has suffered from cancers such as carcinoma, squamous cell carcinoma, or melanoma. If the injury is not the result of cancer or some other health-related condition, then the corrective ear reconstruction procedure is relatively straightforward and will be similar to the ones performed for Microtia or Otoplasty. However, if the injury is due to a cancer, there are other factors that should be considered, such as if radiation therapy has occured. Your surgeon will consult with your oncologist to develop the proper plan that produces the best prognosis for full recovery. Thanks to Menage a Moi for the photo of a man’s ear.